After the temple our driver asked us if we preferred fashion or jewelry and we responded fashion hoping for some kind of market. Sadly it was not to be and we were taken to an Indian suit maker to look through Hugo Boss and Armani catalogues. I asked about the prices for suits and was shown several reams of 'high quality' fabric which was marked Made in Italy. Being a bit of a sceptic I'm not certain that was actually the case as I'm sure the Thai would have no qualms labeling their fabric with whatever the buyer asked for! Of course the price of suits dropped very quickly from 6000 Baht to 4000 when I suggested that I needed to look around at more than one establishment before committing to a purchase. Sadly the salesman became a bit aggressive at that point which made it easy for us to leave. We then asked our driver to take us to the Democracy monument as those that know me in Melbourne will be familiar with my obsession for boat noodles (Guay Teow Rhua) and I had read that this was the place to find them. When we arrived we paid the driver and sent him on his way comfortable that we could find our own way home. So we wandered around looking for the Boat Noodles alley consulting our maps and guides and of course getting several offers of help from the locals. After a lot of searching I looked at another of my guides and realised I had made a mistake and we were at the wrong monument! 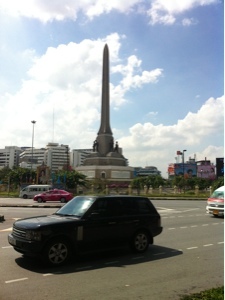 In very western style I had confused the Democracy monument with the Victory monument! Well of course to us westerners they are the same thing. Once again Tina stepped up and pushed us on to jump in a taxi to the correct monument. My guide had told me that the place I wanted was near the Victory monument BTS. Well near is a very relative term and after about 15 minutes of walking and carry the stroller up and down overpasses we finally found it! We took a seat near a pretty festy canal and tried to order by pointing and saying 'moo' which I understand is pork. 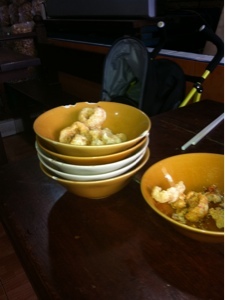 The waiter called over a colleague who spoke English and we ordered 3 bowls, one pork, one beef and one with no chilli for Charlie. 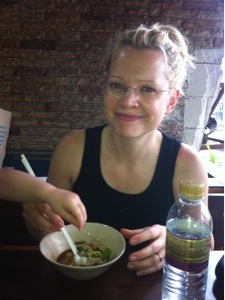 I thoroughly enjoyed the noodles which are a very small serve where the norm is to order multiple bowls and stack them up in some sort of boast about how much you gave eaten. 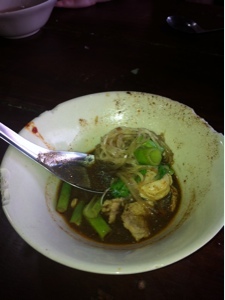 I managed 2 pork and 2 beef and found the broth delicious. I believe it it thickened with pigs blood although I did not tell Tina this. 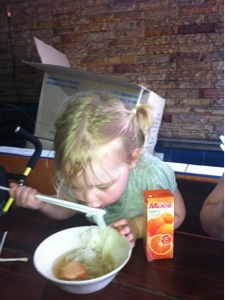 Charlie also enjoyed her noodles and just loves an excuse to test her chopstick skills. 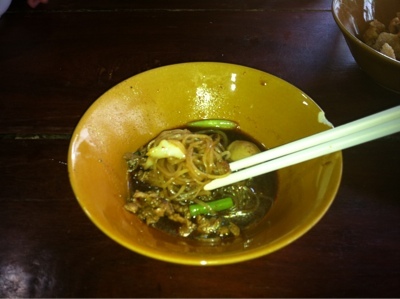 Boat noodles are available in Melbourne and of course I have tried them wherever I could but they are definitely not as tasty as the local version, I suspect the pigs blood is absent from the Melbourne version and they also don't do the small serves in multiple bowls opting instead for a single bowl serve for around $10. I predict that in the not to distant future the Thai style will be the next big thing in Melbourne as there is definitely a demand for these types of quirky meals. Feeling very happy with ourselves for rescuing yet another failed food finding mission we jumped in a taxi and headed home. I'm pretty sure the driver scammed us too as the meter started at 57 Baht which I assumed was the previous passengers fare. I pointed this out to him with no expectation he would do anything about it but I suppose I just wanted him to know we were aware of what he had done. It's hard to be upset about being scammed $2.